Submitted photo Jeff Thibodeau, who graduated from Wright State with a bachelor’s degree in business marketing in 2007, founded Innovative Vending Solutions, which will supply a social media-activated vending machine as part of Homecoming Week. 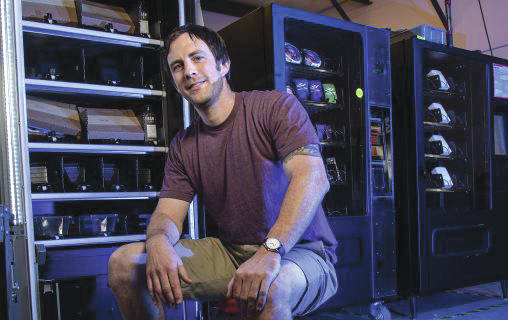 Jeff Thibodeau’s company has supplied the vending machines for more than 300 different businesses, organizations and nonprofits. FAIRBORN — They are growing in popularity and can be found in shopping malls, sports venues, trade-show booths and even on piers. There are two at Twitter’s headquarters in San Francisco, one in Denver’s football stadium and one in Cleveland’s baseball stadium. They are social media-activated vending machines that dispense free hats, T-shirts, gift cards and other products. And there will be one during Homecoming Week at Wright State, the first university in the state to have one. The machines combine the pleasure of posting on social media with getting free products from a vending machine. The vending machine will be operated in the Student Union Atrium from 11 a.m. to 3 p.m. Wednesday, Sept. 27, and Thursday, Sept. 28. It will dispense Wright State-branded caps and T-shirts. The machine has a touch screen on the front that provides instructions to the user. To get a free item, the user is asked to post a message or photo on Twitter or Instagram from his or her smartphone. For example, a Wright State student may be asked to post or Tweet about what he or she likes best about being at Wright State and send the message to a designated hashtag. As soon as the post hits Twitter or Instagram, the screen on the machine changes to vending mode and dispenses a selected item or one at random. Companies and organizations use the vending machines to gain followers on social media and create a buzz about their products and services. They also use the machine to capture data about the users and their opinions about the company’s products and services. Some machines display the products through glass. Other machines just have a touch screen on the front. But most are colorfully branded with logos from the company, university or organization. Sometimes companies will put a mix of products in the machine that may include less expensive items such as stickers, pens and keychains but also a grand prize such as an iPad. The products are then dispensed randomly, giving each user a chance to win the grand prize. Thibodeau landed a job in sales with Cincinnati Bell and one day paid a call on Nick’s Novel-Tee’s, a T-shirt shop in the Dayton suburb of Moraine. The owner, Patrick McDonald, had a concept drawing of a T-shirt vending machine on the counter. So the two men formed a partnership and founded Innovative Vending Solutions, which is headquartered in West Carrollton. The company put its first vending machines in the Dayton Mall and at Danberry Cinemas. The business grew slowly and then about five years ago exploded when the two businessmen began combining vending-machine technology with social media. The company was one of the first to tap its machines into social media and has grown steadily, currently employing about 20 workers. Row after row of vending machines sit in the company’s West Carrollton warehouse, ready to be shipped out. There is one for Texas A&M and even “Soar With Reading,” a Jet Blue-sponsored machine that dispenses free children’s books in low-income areas. The company both sells and rents out the machines and over the nine years of its existence has worked with more than 300 different brands, agencies, companies and nonprofits. Machines have been installed in New York City, Las Vegas, Los Angeles as well as in Canada, Australia and Dubai. There was one in Fountain Square in Cincinnati to promote the 2015 Major League Baseball All-Star Game. The company acquires the shells of the machines from a manufacturer, installs the computer software that controls the motors, and prints and adheres the machine wraps. Machines typically cost anywhere from $5,000 to $20,000. 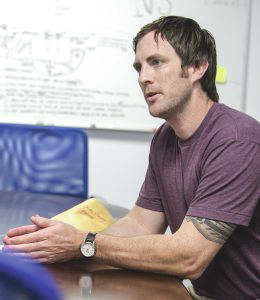 “We can turn a machine around in a few days if the customers gives us everything we need,” said Thibodeau. https://www.fairborndailyherald.com/wp-content/uploads/sites/50/2017/09/web1_Jeff-Thibodeau-19462_016-1-508×320.jpgSubmitted photo Jeff Thibodeau, who graduated from Wright State with a bachelor’s degree in business marketing in 2007, founded Innovative Vending Solutions, which will supply a social media-activated vending machine as part of Homecoming Week. https://www.fairborndailyherald.com/wp-content/uploads/sites/50/2017/09/web1_Jeff-Thibodeau-19462_001-260×300.jpgJeff Thibodeau’s company has supplied the vending machines for more than 300 different businesses, organizations and nonprofits.